I had to take down the cabinet over the sink because it was a little too scuffed, and since it was made of particle board, I couldn’t paint it. I replaced it with an Ikea mirror that uses a hinged mount – the perfect solution since the tiled part of the wall sticks out. It was also an oddly sized space for a mirror and this square one fit. 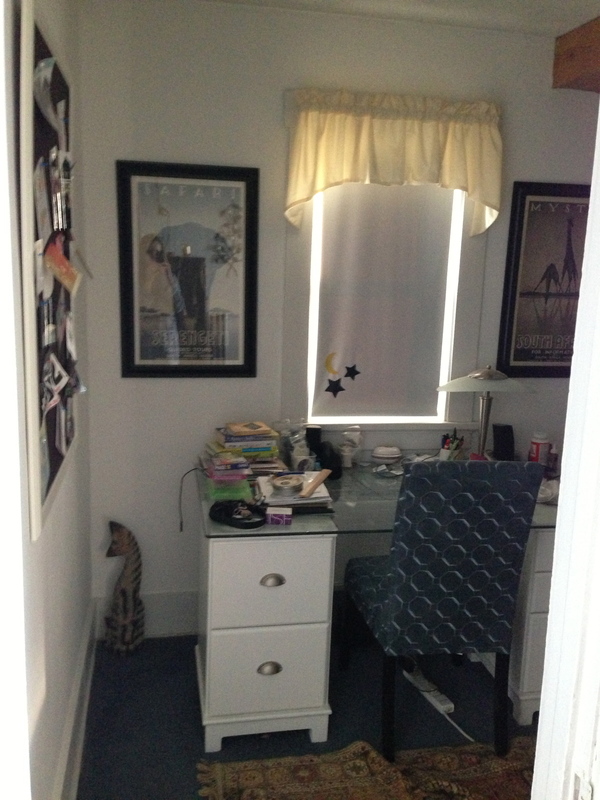 (It looks a little high in the picture, but it’s really that the light fixture is oddly low. We hung the mirror at a height so normal-height people could use it.) I added two floating shelves with baskets above the toilet for a little extra storage within arms reach when I’m at the sink. Since I’m working with these odd cabinets in the shower (which are nice because of all the storage), I had to mount the shower curtain rod at ceiling height. 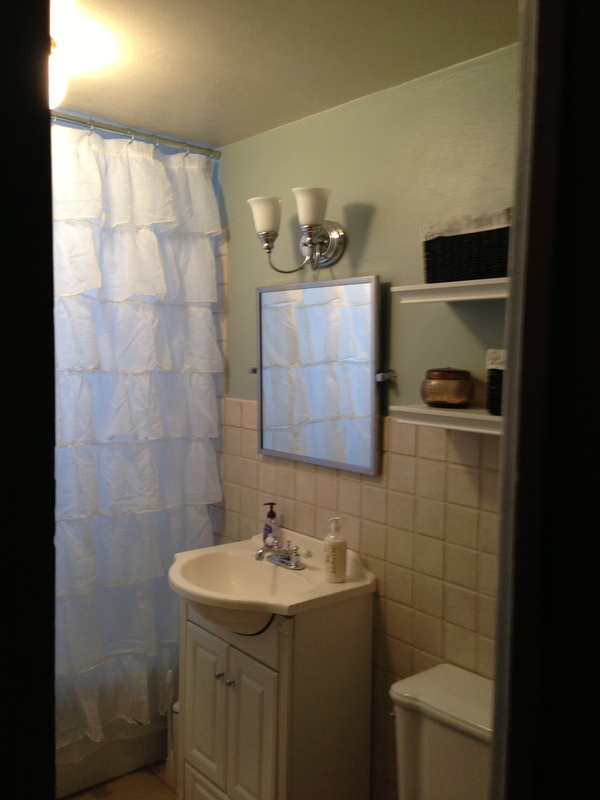 I had to order an extra long shower curtain, so my options were limited, but I like the ruffled white curtain (with white fabric liner) – it adds some texture and feminity to my really linear bathroom. We also painted the bathroom. Funny story – I had a ton of samples from the paint store and kept holding them up on the wall, and this one was the instant hit with me and my mom – and then I realized it was the exact same color I had painted my bedroom upstairs. So I just used my leftover paint from that room. And lastly, my pictures. 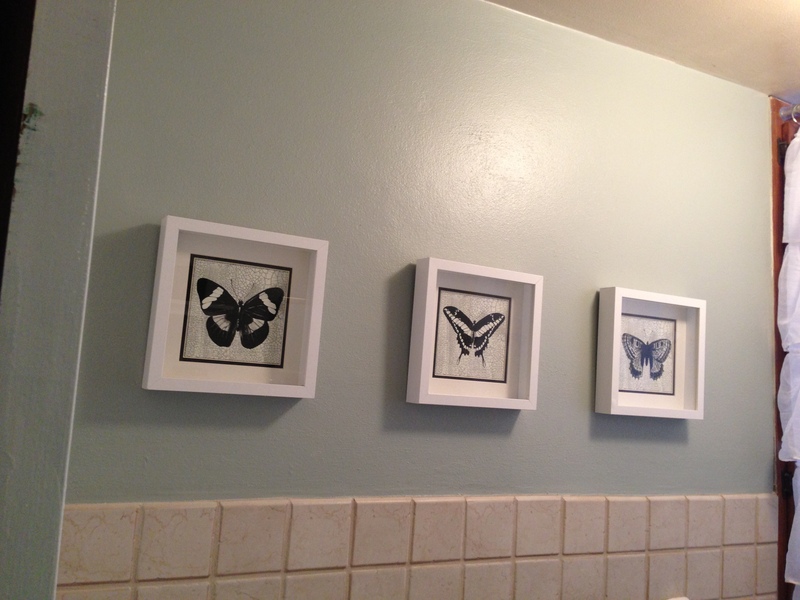 I took the messed up framed butterflies from my hallway and cut them down to square size with a utility knife. Then I fit them in these extra-deep square frames from Ikea. I’m all moved in to my new place. 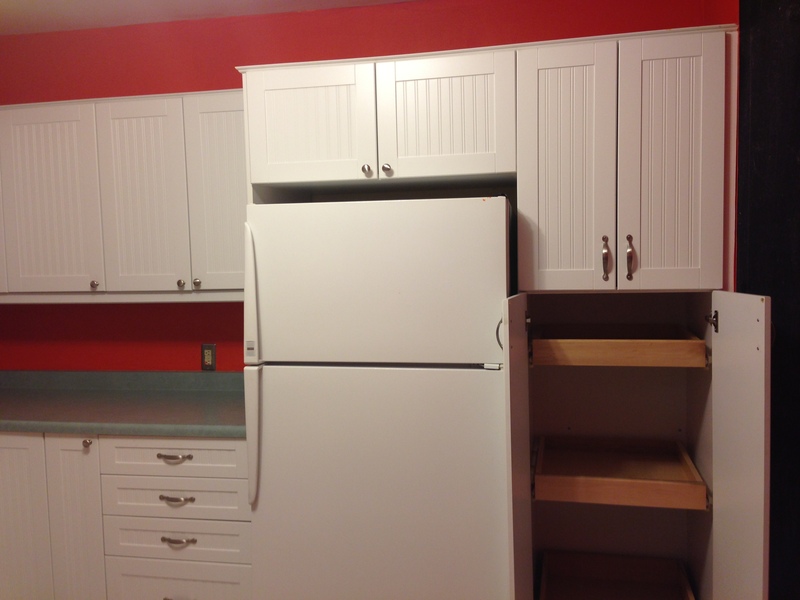 It was a lot of work: new paint, moving of heavy objects, things into boxes and cupboards and bags. I’m still getting things sorted out, but I thought I’d give a preview of what I’m working with. 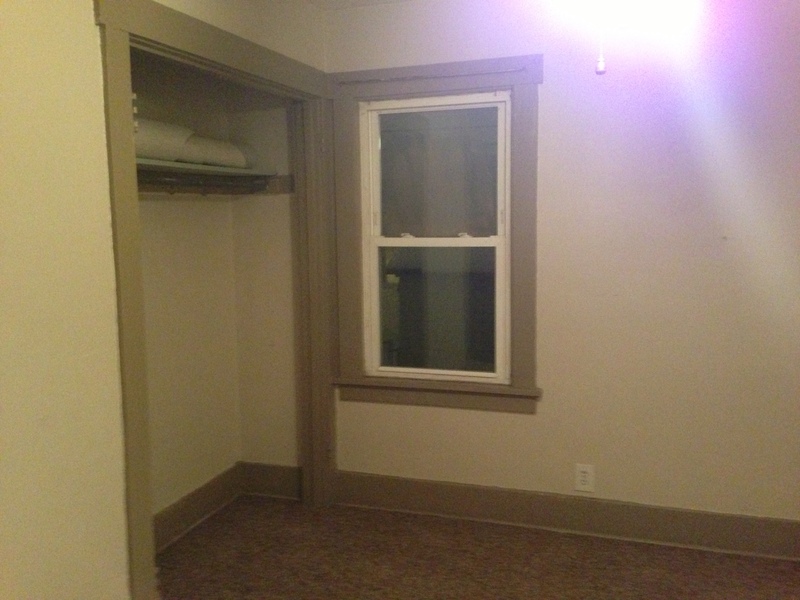 Her’s the first bedroom: tannish walls, old taupe-y paint, no closet doors. Brand new carpeting though, so bonus! The bathroom needed a really good scrub down, but there are decent bones. 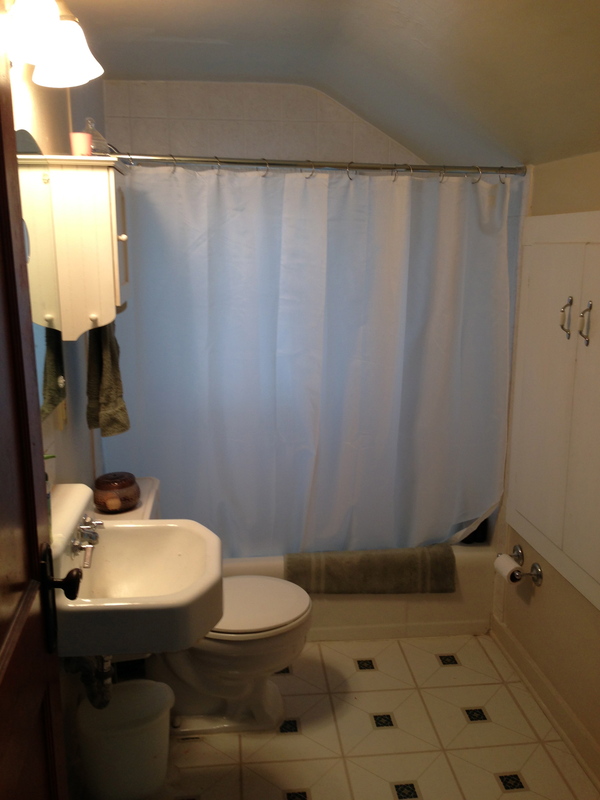 In the shower, hidden behind the door in this picture, is a massive double-decker storage closet. 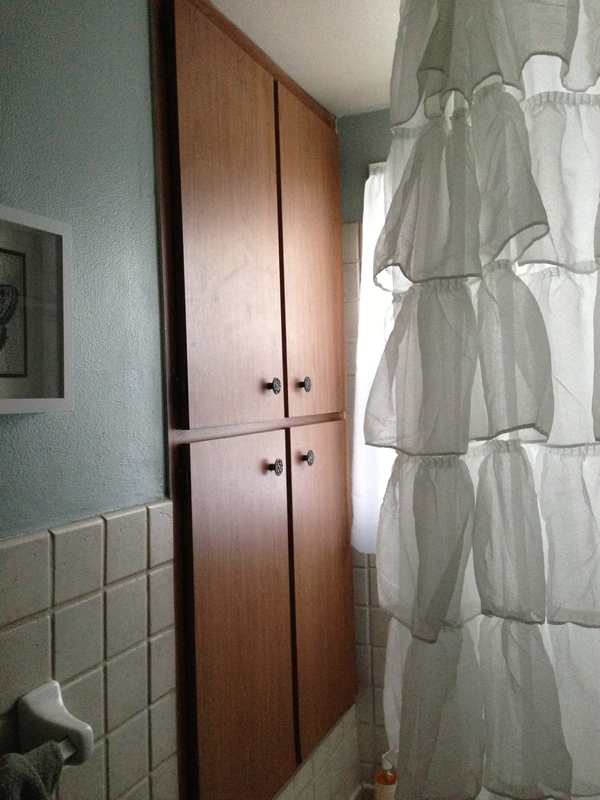 The medicine cabinet is unfortunately made of particle board and badly in need of painting or replacing. The office. Again, tan and taupe, with no closet doors. And a big ol’ radiator in an inconvenient spot. The kitchen had bright red paint (very patchy in person), old green countertops, and really nice new appliances and cupboards. Plus a ton of storage! 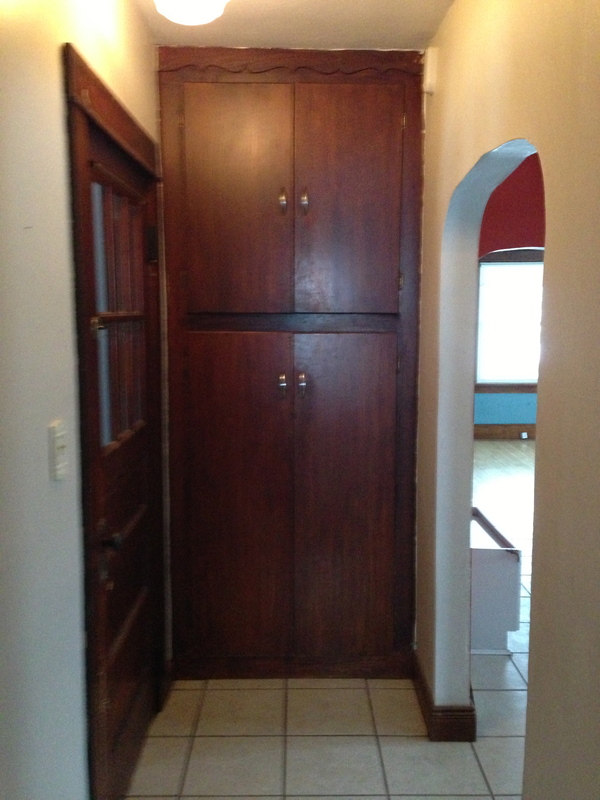 Those are pull-out shelves in the tall pantry. Plus there was a bonus banquet made from some extra upper cupboards. You can see in this photo that the one on the left is damaged – apparently cupboards aren’t made to withstand the weight of someone sitting on them. 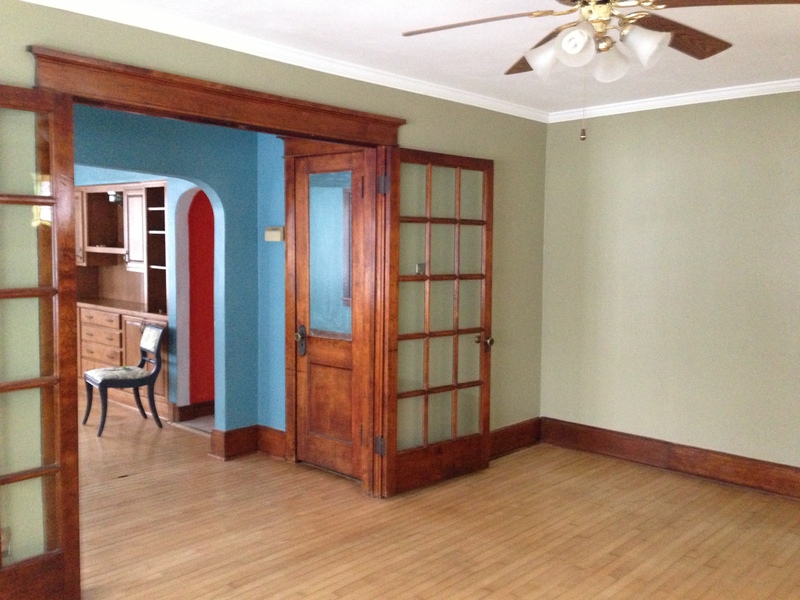 The living room was actually a decent shade of green and has giant windows and french doors. Unfortunately, as you can see on the left in this photo, there were some chips in the wall, so the room had to be repainted. 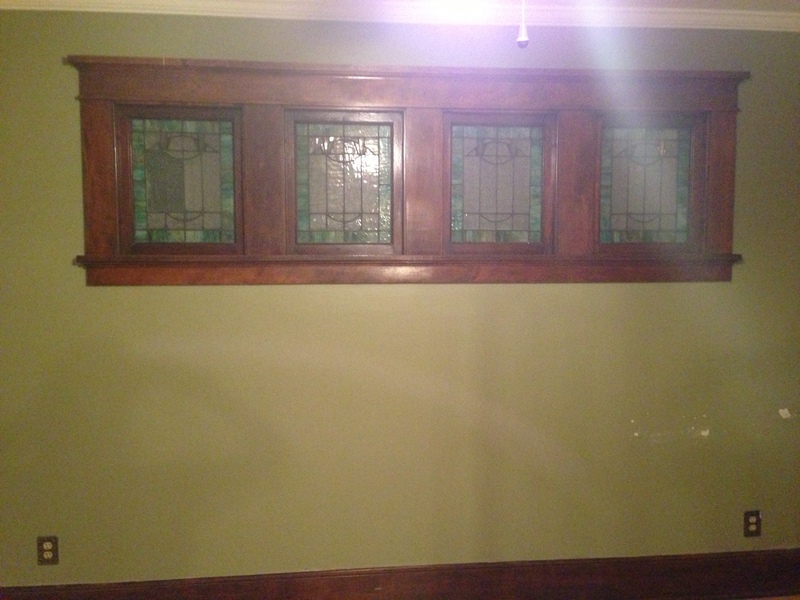 Another shot of the living room, showing off the chips and the row of pretty stained glass windows. 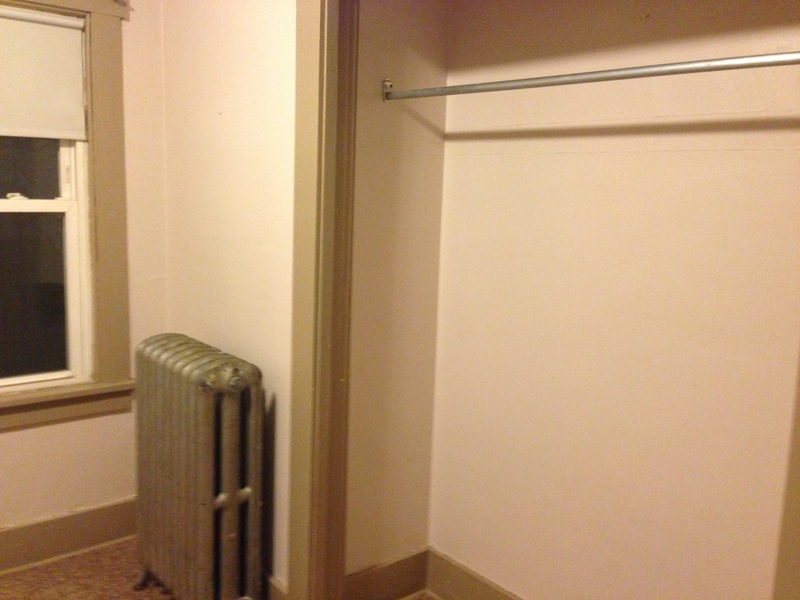 The back hallway, with another huge closet (this time with doors). 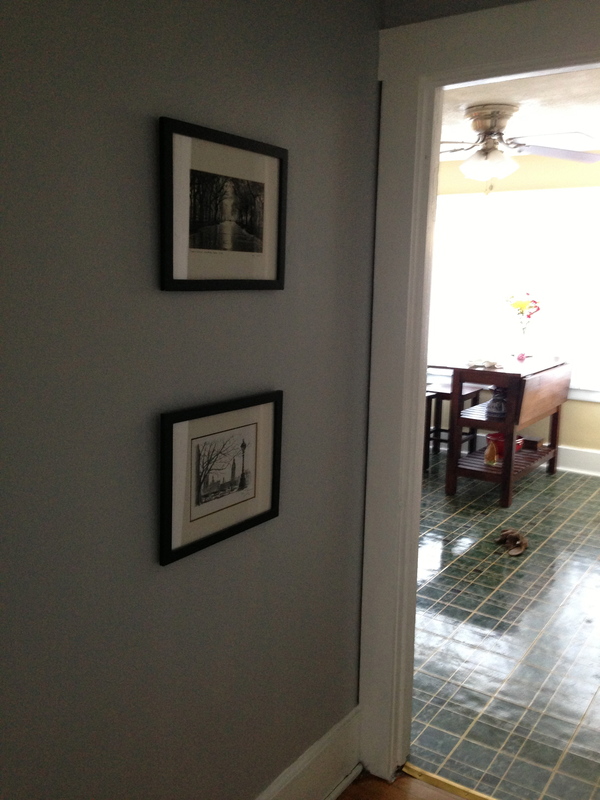 Here you can see my front door in the little foyer and one wall of the dining room. 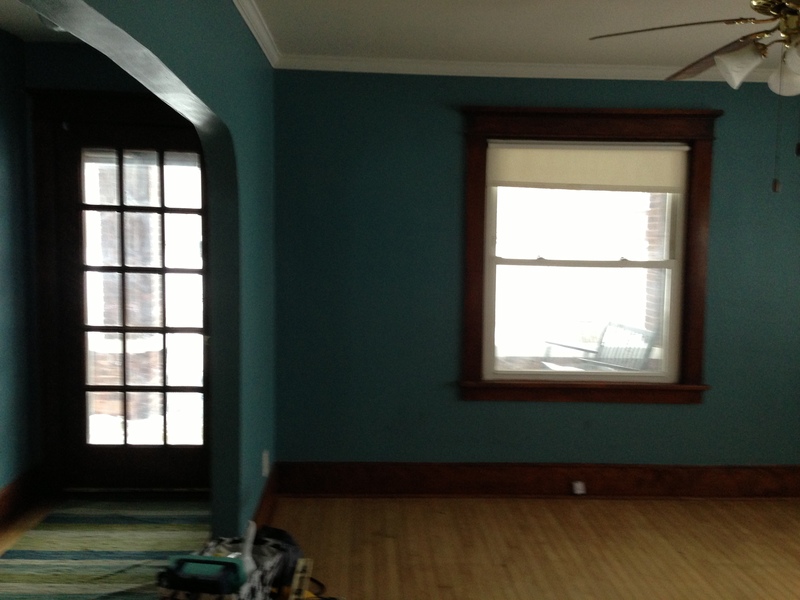 Both were a bright, vivid teal – but there were lots of scuffs from bicycles. 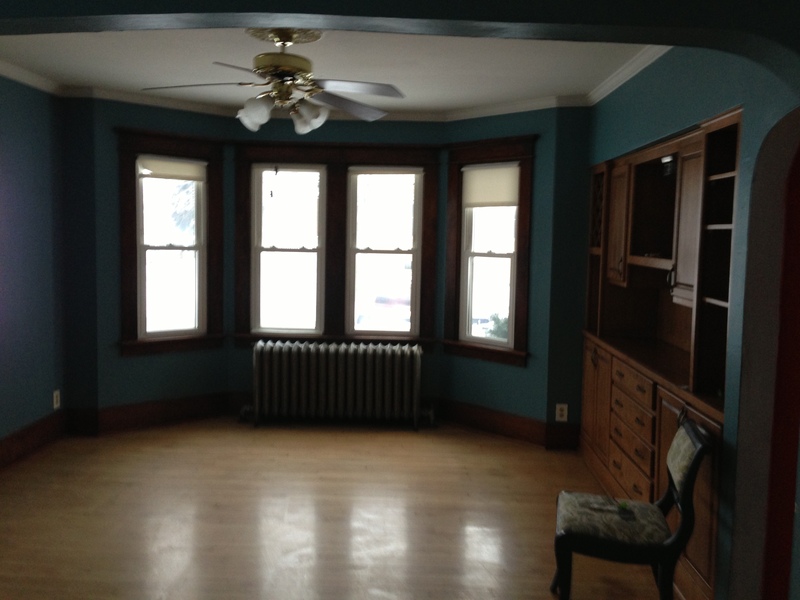 Another view of the dining room, showing the built-in buffet and large bay window. 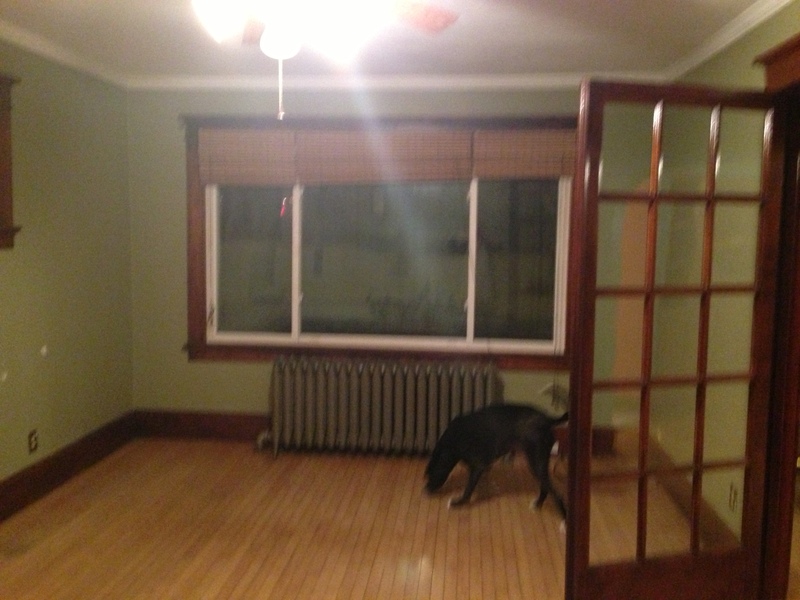 And another view of the living room, looking into the dining room with a tiny sliver of the kitchen. Very bright! As you can see, this place has great bones, but really needed some love in the form of cleaning and painting. I can’t wait to show you some progress. I started writing this post before I started moving. Then, no internet for three weeks (oh, the agony!). But now that I’m settling into the new place, I thought it would be fun to take a look at the old place. Mary’s post about her living room is a pretty good description of how my style has evolved – I’ve worked with what I had and made the most out of things I don’t necessarily love. I have a lot of hand-me-downs, a lot of thrift store finds and a lot of furniture from box stores like Ikea and Target. And you know, I think I’ve made that work pretty well. That’s been my budget, and I think I managed to mix the practicality of using what I had and throwing in some smaller new stuff to make it work. So let’s take a tour, shall we? 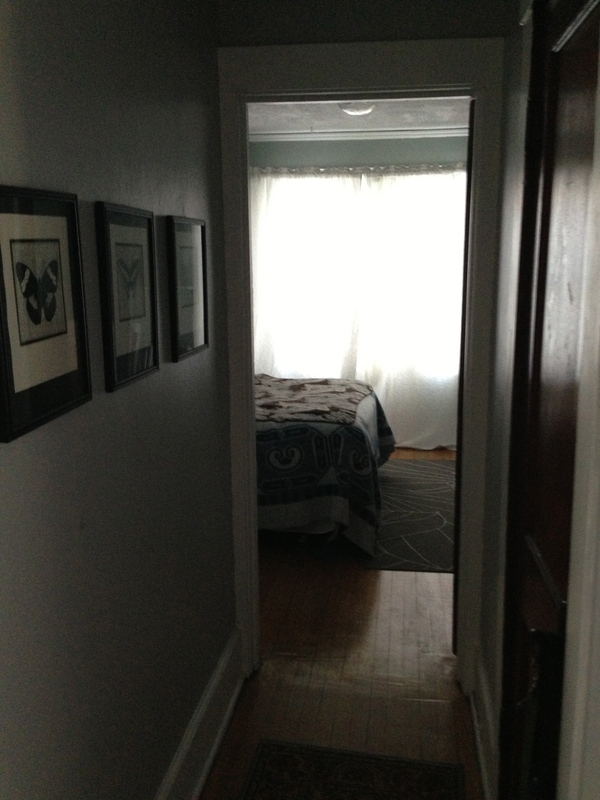 You enter the apartment at the top of a flight of stairs (no landing), and step into a narrow, L-shaped hallway. Since the space was so narrow (the exact width of the doorways), I only hung pictures on one wall in each passage, but I think keeping the frame sizes and shapes consistent really dressed up the space. 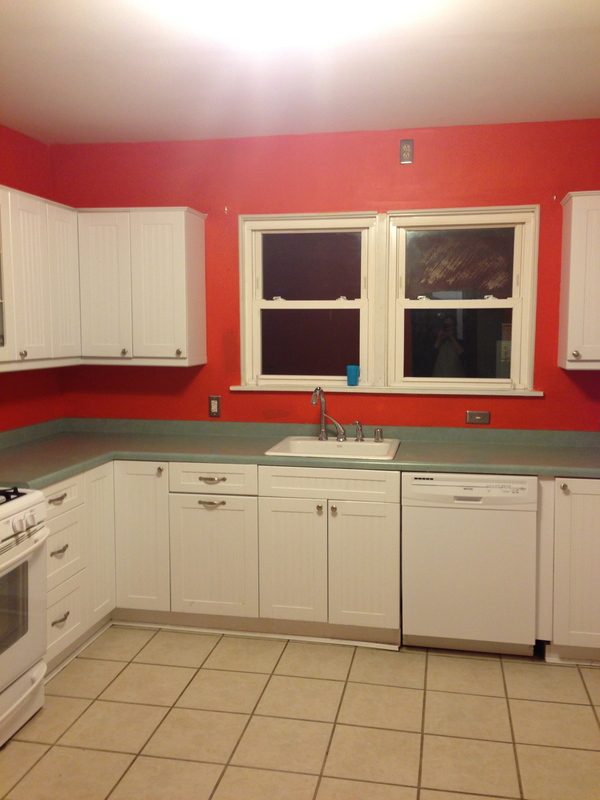 Since I painted so much of the apartment, I left the kitchen color as it was. It was a beige-y yellow that felt a bit Tuscan to me. 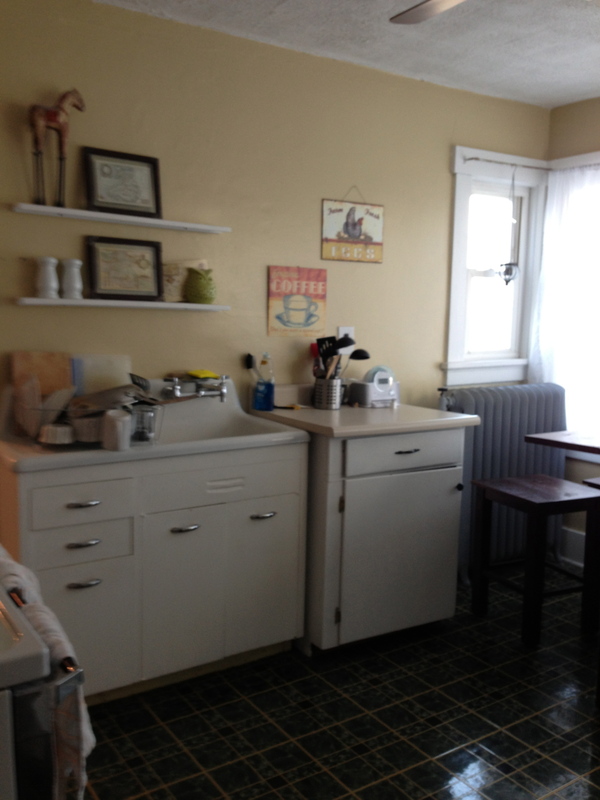 The cupboards were a mishmash, but the giant wall of windows made up for any shortcomings in this kitchen. Pity the curtains are closed in this picture. 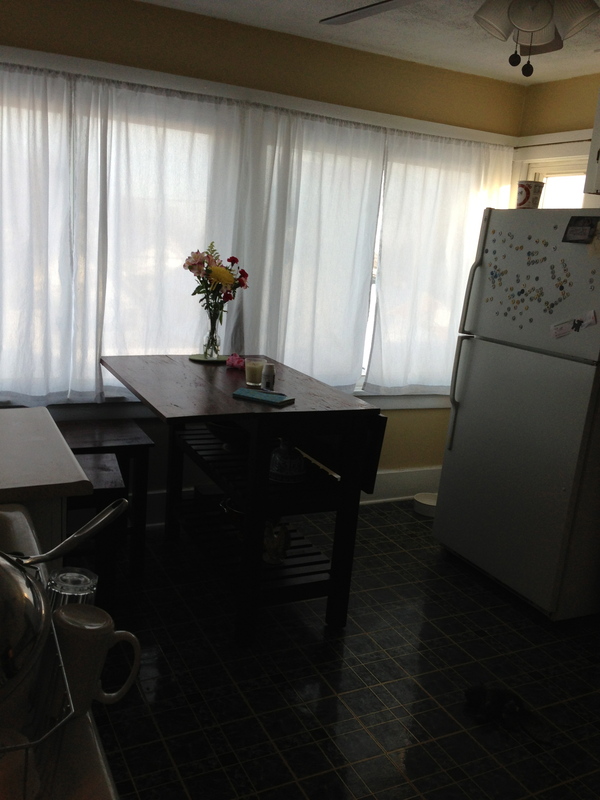 I invested in a nice island-type table that could seat four (even if you could only crack open the fridge when both flaps were up), added narrow shelves above the sink, asked my mom to make some basic cotton curtains for the windows (both for privacy and temperature control). 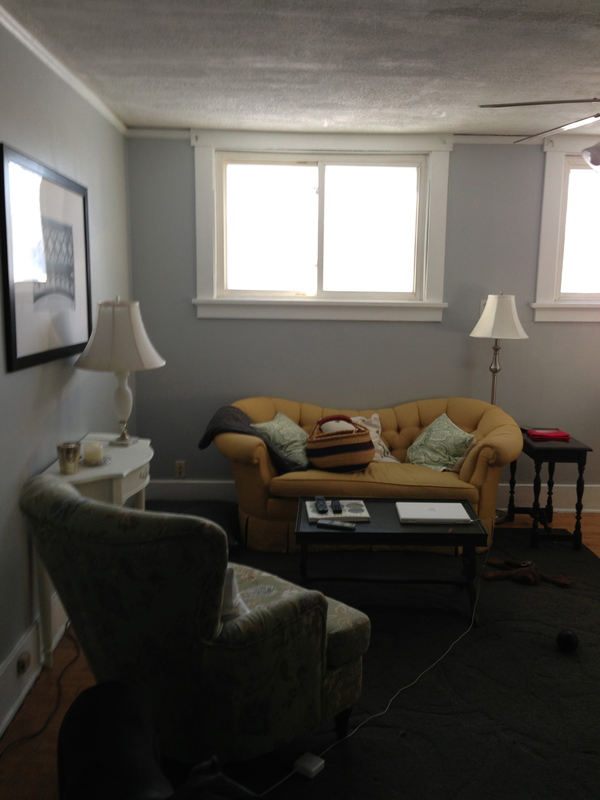 And we added a ceiling fan, which made a huge difference in the functionality of this room in summer. 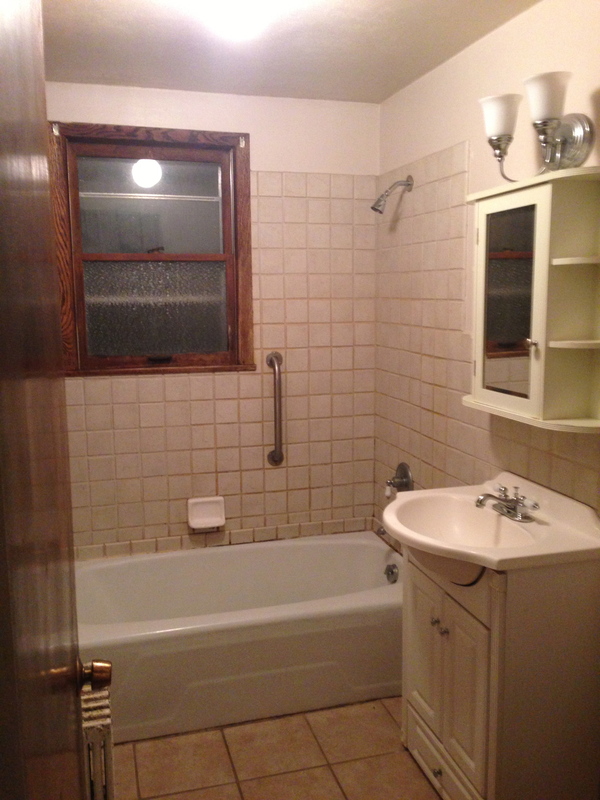 Oddly, the bathroom was tucked under the eaves right off the kitchen. Not stunning, but there was a ton of storage that made it usable. The sage green towels I’ve had for years looked pretty good too. 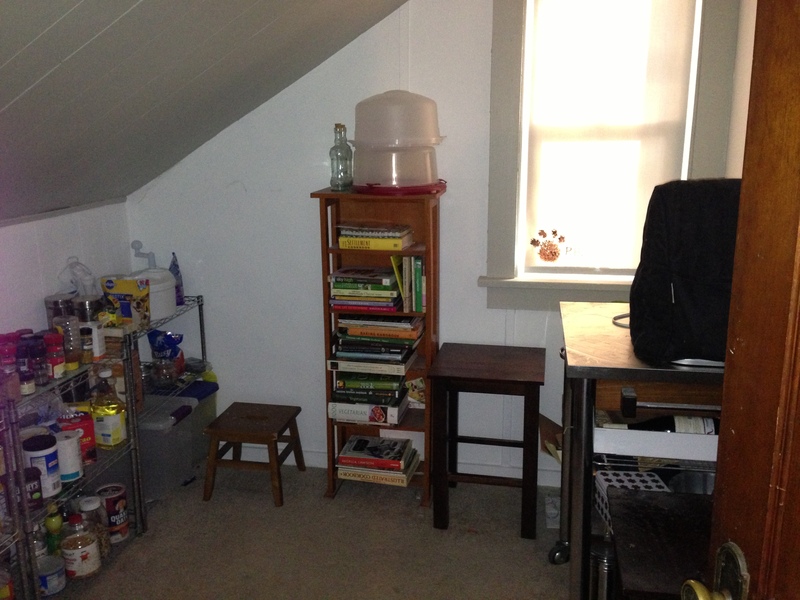 On the other side of the kitchen was a small carpeted room that I used as a pantry. Since it had an outlet and a light, I was not only able to store food in there, but kept my kitchen aid mixer and microwave in there too. It was just a step away from the stove, and really helped keep my limited counterspace clutter-free. 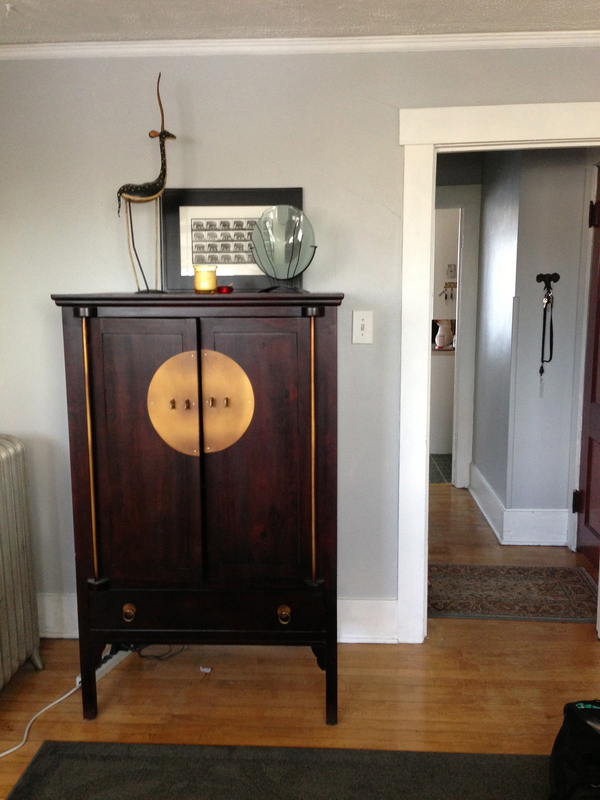 My living room evolved around a couple key hand-me-downs and some lucky clearance finds. The loveseat (and despite the size of the room, I could only have a loveseat because of the narrow hallway and door) was a gorgeous designer hand-me-down that used to belong to an interior designer friend of the family. The green chair and rug were both new, but floor models, so I got them each for about 75% off from Pier One and Ikea respectively. These are three pieces of furniture that I really love, but I have discovered that the loveseat is fantastic for curling up to watch a movie or read a book by yourself, but not really functional for company. Now, you’ve seen these chairs before. They weren’t quite what I had in mind for this space, but they were a free hand-me-down from my mom, and I do love how they turned out with new paint and fabric. 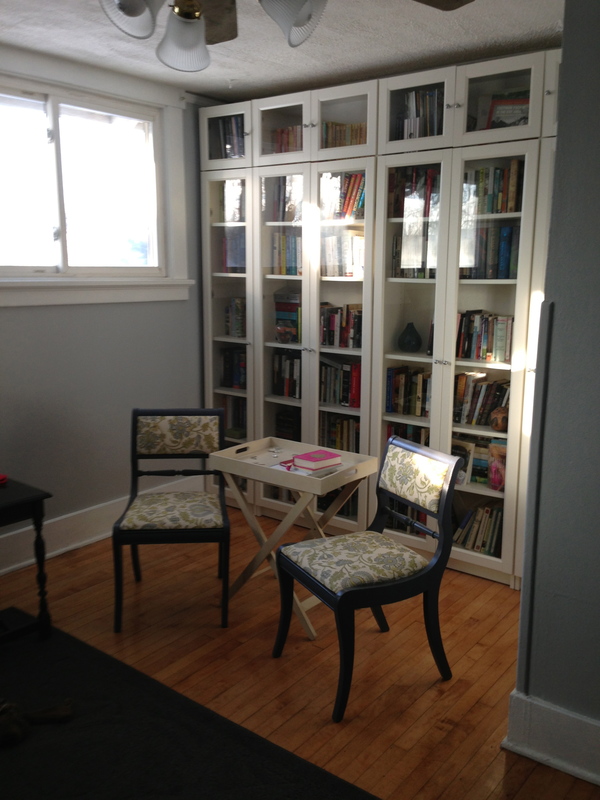 I also love how glass doors turn the cheapest Ikea bookshelves into something really special. 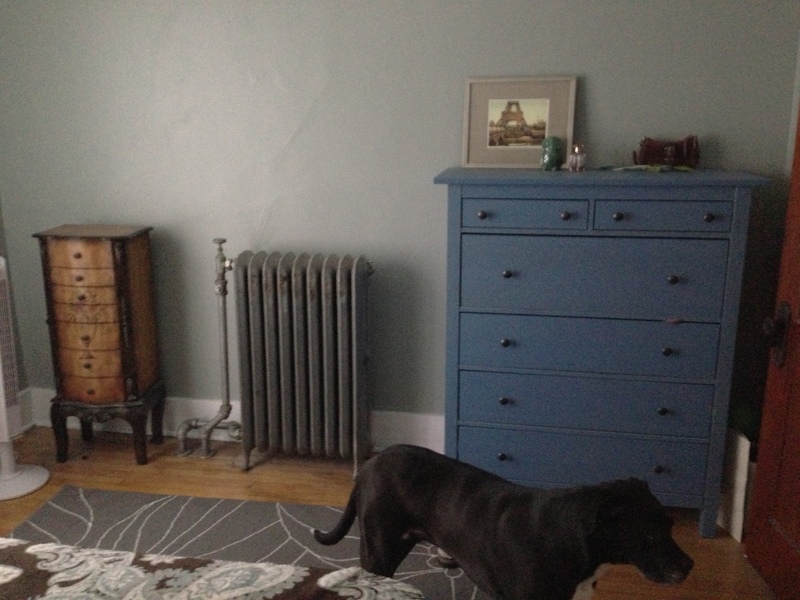 I also really like my TV armoire. I like that it keeps the TV dust-free and out-of-sight when I ‘m not watching, that it’s actually made of real wood with a nice finish, and that it was another free hand-me-down from friends of the family. I’m not crazy about the way you can see all the cords underneath, or about how wide it is, but all-in-all, it’s a nice piece. Off to the side of the living room was another under-the-eaves room, which I used as an office. I had a desk made of two file cabinets and a huge glass table top. I regret buying that glass table top! It’s too heavy to move by myself and it’s so large I have to use brackets to brace it against the wall. 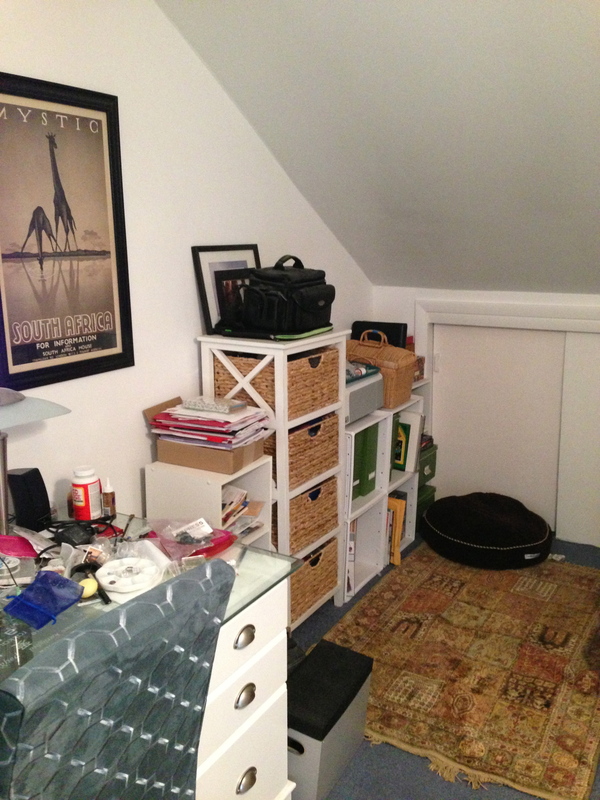 The room had another sloped ceiling, but was long enough to pack in quite a bit of storage for my craft and office supplies. The bedroom was one room I never really did much with. The Ikea dresser was purchased to fit a specific space in a previous apartment (and I’m sick of the blue) and I never really found a rug I liked, so I just threw down a tiny Ikea mat. Also, the radiator made bed placement really difficult. 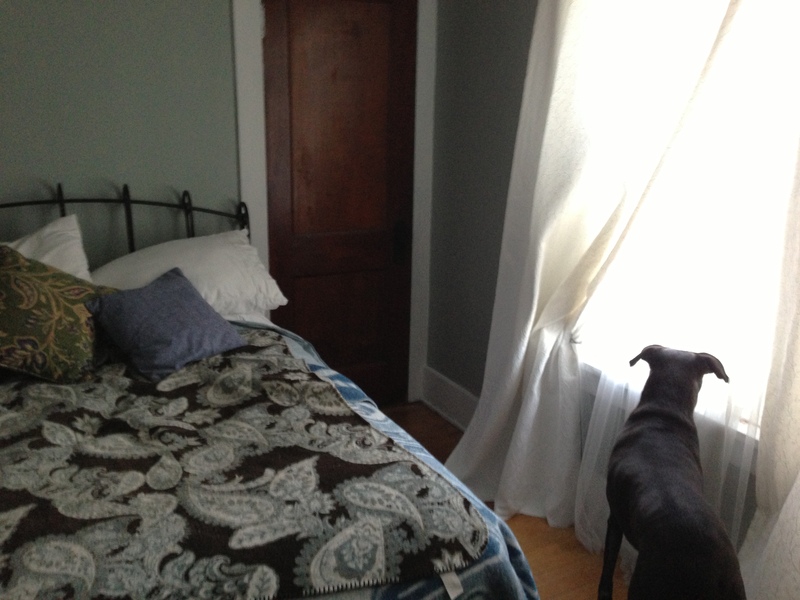 I do love my textured white curtains (and the cute dog peeking out the window). But I’m not crazy about my headboard anymore. Or the return-discounted mattress set I purchased almost 10 years ago (it’s a full-size firm bed, and I’m a side-sleeper who’d rather have a soft queen-sized bed). Also not great? The blankets I constantly have on the bed to keep dog hair off my sheets because someone likes to nap there while I’m at work. So there it is. Not super-stylish, but not too terrible either. But now that I’m in the new place, I’m eager for some change. And, for the first time in my adult life, I can actually purchase a few new things too. I still have a pretty strict budget, but there’s a little more flexibility to, say, buy a couch that I like, instead of one at Goodwill. So I think it will be really interesting to see how things evolve in the new place. At the same time, I keep reminding myself that part of the reason I have inexpensive, fine-for-now furniture is because I rent, and I never know how long I’ll be somewhere or what the next place will be like. So it still doesn’t make a ton of sense for me to spend a fortune on decorating a place I might be in for a year or two. And money I don’t spend on that, is money I can eventually spend on buying and decorating a place that I actually own.